You may think you’re too old for cartoons, or for any original programming aired on Nickelodeon, but you’re not. In fact, one of the most innovative, boundary-breaking, and just plain fun shows in years is both of those things. 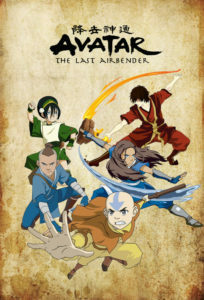 It’s called Avatar: The Last Airbender and if you haven’t seen it, do so now (it’s on Netflix Instant). Airbender actually ended a few years ago and its sequel, The Legend of Korra, just wrapped up its first season. So, why am I talking about Airbender now? The complex answer is because the show is everything we love here at With An Accent: it uses media to educate, especially about other cultures, it’s American but in many ways doesn’t feel so, and it delves into settings and concepts not often examined on American TV, especially in kid’s entertainment. In other words, it’s super geeky. The short answer is: because anyone who hasn’t seen it absolutely must. There can never be too much word spread about this exceptional series. I seriously don’t know anyone who is in anything but raptures over it; I’ve managed to find a few people who didn’t like BBC’s now-hallowed Sherlock, but even all of them love Airbender. The show is set in a fantasy world, but one that’s clearly Asian in culture (the way that many pseudo-medieval fantasies are in vague British/European settings). The world is divided into four great nations: Water, Earth, Fire, and Air. Some members of each nation are born with the ability to “bend,” or control, the element of the culture to which they belong (one’s chances of being a bender are greater if one’s parents are benders, though two benders can produce a non-bender and vice versa). 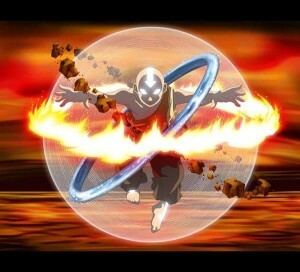 Only one person in each generation can control all four elements: The Avatar. The primary purpose of the Avatar is to maintain balance in the world, to prevent any one nation from assuming too much power over the others. The Avatar is born every generation into one nation and then reincarnated next into another, continually cycling through all four. Thus each Avatar tends to be the strongest in the element of his or her birth nation, but learns through time to master the other three elements as well. The Avatar is also connected to the spirit world, and when he or she traverses it can speak with incarnations of prior Avatars to gain their wisdom. In Airbender the latest Avatar is Aang, a 12-year-old Air Nomad who runs away from home when told he will have to leave the temple (Airbenders live in temples as monks) to travel the world studying other forms of bending. Aang and his sky bison, Appa (sky bison are what they sound like: absolutely adorable giant flying bison), are caught in a terrible storm. Aang freezes them in an iceburg to survive. He’s revived 100 years later by Sokka and Katara, siblings from the Southern Water Tribe. He learns that while he’s been asleep the Fire Nation started a great war, with the goal of conquering all other nations. The Fire Nation went after the Air Nomads first, knowing that the Avatar was among them. Now the Air Tribe is annihilated, its people extinct, and the Fire Nation has begun marching on the Earth Kingdom.